If you're looking for some incredible and adventurous activities for your stag do, North Wales is the destination of choice. This fantastic adventure land has some of the best activities in the world let a lone the UK. North Wales has some pretty impressive accolades when it comes to the Zip Wire activity, well it is hilly which is fairly handy - Holland doesn't stand a chance! First of all it has the fastest zip-line in the world and the longest in Europe (see velocity below). Then there's the Titan which is the longest zip-zone in Europe. Not forgetting the Caverns, which is zip lining in underground Caverns, how cool this that! All of these activities can be booked on our website, go and take a look. 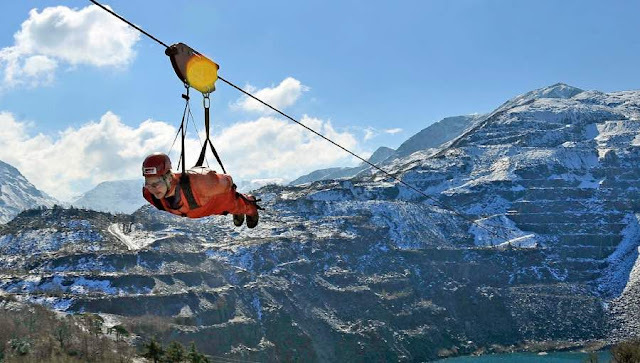 The longest zip wire in Europe and the FASTEST in the world - how cool is that! You'll be lying down for this one and as you'll reach speeds of over 100mph, there's only one thing you'll be shouting - SUPERMAN!! !